The Ivory Coast is a country in western Africa. 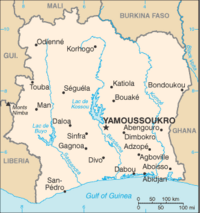 Its capitals are Yamoussoukro and Abidjan. The country was a French colony until 1960 and French is still the official language. Ivory Coast has more than 60 ethnic groups, usually classified into five principal divisions: Akan (east and center, including Lagoon peoples of the southeast), Krou (southwest), Southern Mande (west), Northern Mande (northwest), Senoufo/Lobi (north center and northeast). The Baoules, in the Akan division, probably comprise the single largest subgroup with 15%-20% of the population. They are based in the central region around Bouake and Yamoussoukro. The Betes in the Krou division, the Senoufos in the north, and the Malinkes in the northwest and the cities are the next largest groups, with 10%-15% each of the national population. Most of the principal divisions have a significant presence in neighboring countries. Of the more than 5 million non-Ivoirian Africans living in Ivory Coast, one-third to one-half are from Burkina Faso; the rest are from Ghana, Guinea, Mali, Nigeria, Benin, Senegal, Liberia, and Mauritania. The non-African expatriate community includes roughly 10,000 French and possibly 60,000 Lebanese. As of mid-November 2004, thousands of expatriates, African and non-African, had fled from the violence in Ivory Coast. The number of elementary school-aged children attending classes increased from 22% in 1960 to 67% in 1995. Education: Years compulsory—school is not compulsory at this time. Attendance—57%. Literacy—51%. Health: Infant mortality rate—111/1,000. Life expectancy—46 years. An estimated 35 to 40% of the population of 18 million is Christian and an equal number is Muslim. An estimated 25% practices indigenous religious beliefs. Many persons who are nominally Christian or Muslim also practice some aspects of indigenous religious beliefs, particularly as economic and political conditions worsened after the failed 2002 coup. Ivory Coast's constitution of the Second Republic (2000) provides for a strong presidency within the framework of a separation of powers. The executive is personified in the president, elected for a 5-year term. The president is the head of state and commander in chief of the armed forces, may negotiate and ratify certain treaties, and may submit a bill to a national referendum or to the National Assembly. According to the constitution, the president of the National Assembly assumes the presidency for 45–90 days in the event of a vacancy and organizes new elections in which the winner completes the remainder of the deceased president's term. The president selects the prime minister, who is the head of government. The cabinet is selected by and is responsible to the prime minister. Laurent Gbagbo has been President since October 26, 2000. Gbagbo took power following a popular uprising supporting his election victory after junta leader Gen. Robert Guei claimed a dubious victory in the 2000 presidential elections. General Guei had assumed power on December 25, 1999, following a military coup d'état against the government of former President Henri Konan Bedie. Coup attempts in 2001 and 2002 escalated into a rebellion and crisis which culminated in the January 2003 signing of an accord for a power-sharing national reconciliation government. Implementation of the 2003 accord has made halting progress, and Ivory Coast remains divided, with rebels occupying the northern half of the country. French Licorne and UNOCI peacekeeping troops observe a green line between government and New Forces positions. Ivory Coast's relations with the U.S. have traditionally been excellent, but have been somewhat strained since Section 508 restrictions curtailed nonhumanitarian aid following the December 1999 military coup. The restrictions were not lifted following the 2000 elections due to questionable governmental interference before and during the election. Looking toward the country's future, the fundamental issue is whether its political system following the upheavals of recent years will provide for enduring stability, which is critical for investor confidence and further economic development. The political system in Ivory Coast is president-dominated. The prime minister concentrates principally on coordinating and implementing the Ouagadougou Political Agreement. However, political dialogue is much freer today than prior to 1990, especially due to the opposition press, which vocalizes its criticism of the regime. Beginning in 1990, Ivory Coast evolved, with relatively little violence or dislocation, from a single-party state. Opposition parties, independent newspapers, and independent trade unions were made legal at that time. Since those major changes occurred, the country's pace of political change had been slow, prior to the period of turmoil ushered in by the December 1999 coup. Ivory Coast has a high population growth rate, a high crime rate (particularly in Abidjan), a high incidence of AIDS, a multiplicity of tribes, sporadic student unrest, a differential rate of in-country development according to region, and a dichotomy of religion associated with region and ethnic group. These factors put stress on the political system and could become more of a problem if the government does not succeed in implementing the Ouagadougou Political Agreement and if the economy does not return to consistent growth. The Ivoirian constitution affords the legislature some independence, but it has not been widely exercised. Until 1990, all legislators were from the PDCI. The December 2000 National Assembly election was marred by violence, irregularities, and a very low participation rate. Largely because of the RDR boycott of the election to protest the invalidation of the candidacy of party president Alassane Ouattara, the participation rate was only 33%. In addition, the election could not take place in 26 electoral districts in the north because RDR activists disrupted polling places, burned ballots, and threatened the security of election officials. Following the legislative by-elections in January 2001, 223 of the 225 seats of the National Assembly were filled. The FPI held 96 seats, the PDCI 94 seats, the PIT 4 seats, very small parties 2 seats, independent candidates 22 seats, and the RDR—in spite of its boycott of the legislative elections—5 seats. Until it took the reins of government in the 2000 elections, the FPI party was the oldest opposition party. Moderate in outlook, it has a socialist coloration but one which was more concerned with democratic reform than radical economic change. It is strongest in the Bete ethnic areas (southwest) of President Laurent Gbagbo. The PDCI's "core" region may be described as the terrain of the Baoule ethnic group in the country's center and east, home of both Houphouet-Boigny and Bedie; however, the PDCI is represented in all parts of Ivory Coast. Former members of the PDCI's reformist wing formed the originally non-ideological RDR in September 1994. They hoped that former Prime Minister Alassane Ouattara would run and prevail in the 1995 presidential election, but Ouattara was subsequently disqualified by Bedie-sponsored legislation requiring 5-year residency. The RDR is now strongest in the mostly Muslim north. Throughout the Cold War, Ivory Coast's foreign policy was generally favorable toward the West. The country became a member of the United Nations in 1960 and participates in most of its specialized agencies. It maintains a wide variety of diplomatic contacts. It sought change in South Africa through dialogue and was the first country accredited to post-apartheid South Africa. In 1986, Ivory Coast announced the reestablishment of diplomatic relations with Israel. France remains Ivory Coast's single most important foreign partner. President Houphouet-Boigny, who was a minister in the French Government prior to independence, insisted that the connection with France remain strong. Concrete examples of Franco-Ivoirian cooperation are numerous: French is Ivory Coast's official language; Ivory CoastIvory Coast adopted the French legal system; a French marine infantry brigade stationed in Abidjan augmented security; thousands of French expatriates continue to work and live in Ivory Coast; and the CFA franc currency is tied to the euro. However, the September 2002 events injected strain into the relationship, as the Ivoirian Government criticized France for its perceived failure to uphold its commitment under the 1961 mutual defense treaty by helping government forces recapture rebel-held areas. However, the French did send additional forces—reaching a total of around 4,000 troops as of fall 2003—to secure the ceasefire line between regular government and rebel forces. The French contingent was joined by a force provided by various member states of ECOWAS that totaled over 3,000 as of fall 2003. Anti-French riots erupted in Abidjan in late January-early February 2003, but bilateral relations subsequently improved amidst ongoing French military and diplomatic efforts to promote a peaceful resolution of the crisis. As noted above, relations with France deteriorated substantially after the events of November 2004. The Ivoirian Government has traditionally played a constructive role in Africa. President Houphouet-Boigny was active in the mediation of regional disputes, most notably in Liberia and Angola, and had considerable stature throughout the continent. In 1996-97 Ivory Coast sent a medical unit to participate in regional peacekeeping in Liberia, its first peacekeeping effort. Ivory Coast's hopes to expand its involvement in regional peacekeeping efforts were derailed by the December 1999 coup. Still a regional economic powerhouse, Ivory Coast hopes to retake its place in promoting regional stability when the resolution of its current crisis permits. In May 2004, Ivory Coast joined the Community of Sahel and Saharan States (CENSAD). Ivory Coast belongs to the UN and most of its specialized agencies; the African Union; West African Economic and Monetary Union; ECOWAS; African Mauritian Common Organization; Council of Entente Communaute Financiere Africane; Non-aggression and Defense Agreement; Nonaligned Movement; African Regional Satellite Organization; InterAfrican Coffee Organizations; International Cocoa Organization; Alliance of Cocoa Producers; African, Caribbean and Pacific Countries; and Association of Coffee Producing Countries. Ivory Coast also belongs to the European Investment Bank and the African Development Bank; it is an associate member of the European Union. Since the outbreak of the rebellion in September 2002 that split the country, the military has reorganized. The former system that broke down the country into four military regions no longer exists. The 21,000-man Ivoirian armed forces (formerly FANCI, now called the Ivorian Defense and Security Forces—FDS) include an army, navy, air force, gendarmerie, and specialized forces. The Joint Staff is assigned to the FDS headquarters in Abidjan. Ivory Coast has a brown-water navy whose mission is coastal surveillance and security for the nation's 340-mile coastline. It has patrol craft that operate in limited fashion along the coast and smaller vessels used to control immigration and contraband within the lagoon system. The operational capability of naval vessels has degraded since the war began. A mutual defense accord signed with France in 1961 provides for the stationing of French forces in Ivory Coast. The 43rd Marine Infantry Battalion is based in Port Bouet adjacent to the Abidjan Airport. Shortly after the beginning of hostilities in September 2002, France established a stabilization force, currently 3,000 troops, under "Operation Licorne." Previously, France had approximately 500 troops stationed in Ivory Coast. In January 2003, the Economic Community of West African States (ECOWAS) placed approximately 1,500 peacekeeping troops from five countries—Senegal (commander), Ghana, Benin, Togo, and Niger—on the ground beside the French peacekeepers. The troops maintained the east-west ceasefire line dividing the country. On April 4, 2004, ECOWAS troops became part of the UN Operation in Côte d'Ivoire (UNOCI) which was authorized under UN Security Council Resolution (UNSCR) 1528. The authorized strength of the UNOCI operation is 8,115 personnel. UNOCI and Operation Licorne coordinate closely to fulfill the terms of UNSCR 1528 and subsequent resolutions. UNSCR 1739 extended the UNOCI and Licorne mandate until June 2007, and UNSCR 1765 extended the mandate until January 2008. GDP (2005 est. ): $15.9 billion. Annual real growth rate (2005 est. ): 0.8%. Real GDP declined by 3.8% in 2003 and rose by 1.6% in 2004. Natural resources: Petroleum (offshore) discovered in 1977, production began in 1980; output in 2004 was 22,000 barrels per day. Gold mining began in early 1990s. Agriculture (27% of GDP, 2004): Products—cocoa, coffee, timber, rubber, corn, rice, tropical foods. Industry (21% of GDP, 2004): Types—food processing, textiles. Services (2004): 52% of GDP. Trade (2004): Exports (41% of GDP)--cocoa, coffee, timber, rubber, cotton, palm oil, pineapples, bananas. Major markets—U.S., France, Germany, Netherlands. Total imports (28% of GDP; U.S. imports, in 2003 $113.6 million)--consumer goods, basic foodstuffs (rice, wheat), capital goods. Major suppliers—France, Nigeria, Italy, U.S., Germany. By developing country standards, Ivory Coast has an outstanding infrastructure. There is an excellent network of more than 8,000 miles of paved roads; good telecommunications services, including a public data communications network, cellular phones, and Internet access. There are two active ports. Abidjan's is the most modern in West Africa and the largest between Casablanca and Cape Town. There is regular air service within the region and to and from Europe and modern real estate developments for commercial, industrial, retail, and residential use. Abidjan remains one of the most modern and livable cities in the region. Its school system is good by regional standards and includes an international school—whose enrollment dropped sharply due to the November 2004 crisis—based on U.S. curriculum and several excellent French-based schools. Recent political and economic problems have delayed Ivory Coast's planned public investment program. The government's public investment plan accords priority to investment in human capital, but it also will provide for significant spending on economic infrastructure needed to sustain growth. Continued infrastructure development has been brought into question because of private sector uncertainty. In the new environment of government disengagement from productive activities and in the wake of recent privatization, anticipated investments in the petroleum, electricity, water, and telecommunications sectors, and in part in the transportation sector, will be financed without any direct government intervention. A return to political and economic stability is critical if Ivory Coast is to realize its potential in the region. Since the colonial period, Ivory Coast's economy has been based on the production and export of tropical products. Agriculture, forestry, and fisheries account for a substantial part of GDP and of exports. Ivory Coast produces 40% of the world's cocoa crop and is a major exporter of bananas, coffee, cotton, palm oil, pineapples, rubber, tropical wood products, and tuna. The 1994 devaluation of the CFA franc and accompanying structural adjustment measures increased the international competitiveness of the agricultural, light industrial, and service sectors. However, reliance on commodity exports exposes the economy to the ups and downs of international price swings. To reduce the economic exposure to price variability, the government encourages export diversification and intermediate processing of cocoa beans. In recent years, petroleum exports have risen significantly, and petroleum is now the country’s largest foreign exchange earner. The 1994 devaluation of the CFA franc helped return Ivory Coast to rapid economic growth until the slowdown evident by 1999. Increased aid flows, rigorous macroeconomic policies, and high international commodity prices, along with devaluation, yielded 6%-7% annual GDP growth rates from 1994-98. Ivory Coast also benefited from Paris Club debt rescheduling in 1994, a London Club agreement in 1996, and the 1997 G-7 decision to include Ivory Coast in the IMF-World Bank debt forgiveness initiative for highly indebted poor countries. In the past several years, economic decline has resulted in declining living standards. Falling commodity prices along with government corruption and fiscal mismanagement brought the economy to its knees by the end of 1999. At that point, the coup d'état and the subsequent institution of the military junta government caused the loss of foreign assistance. Private foreign investment declined precipitously. Government internal and external debt ballooned. As a result, the Ivoirian economy contracted 2.3% in 2000. The government signed a Staff Monitoring Program with the IMF in July 2001, but plans for a subsequent Poverty Reduction and Growth Facility were disrupted by the onset of the crisis in September 2002. The signs of economic and business recovery were encouraging in the mid-year of 2002, but the political and social crisis that began in September 2002 undermined all the efforts to resume cooperation with international donors. The economy has been in a slow decline since the outbreak of the armed rebellion in late 2002, with a cutoff of most external assistance (except humanitarian aid), mounting domestic and foreign arrearages, and a drastic slowdown in foreign and domestic investment. The country is in substantial arrears to the World Bank and other international financial institutions. GDP growth is anemic, reaching 1.6% in 2005, buoyed largely by growing oil and gas revenues, along with steady cocoa exports. Strong economic growth is not expected until peace is firmly reestablished and international financial institutions conclude agreements to reduce the country’s large debt profile. However, with the gradual reintegration of the country, the economy in the north may begin to revive after a prolonged slump caused by the four-year-long division of the country. The early history of Ivory Coast is virtually unknown, although it is thought that a Neolithic culture existed. France made its initial contact with Ivory Coast in 1637, when missionaries landed at Assinie near the Gold Coast (now Ghana) border. Early contacts were limited to a few missionaries because of the inhospitable coastline and settlers' fear of the inhabitants. In the 18th century, the country was invaded from present-day Ghana by two related Akan groups—the Agni, who occupied the southeast, and the Baoule, who settled in the central section. In 1843-44, Admiral Bouet-Williaumez signed treaties with the kings of the Grand Bassam and Assinie regions, placing their territories under a French protectorate. French explorers, missionaries, trading companies, and soldiers gradually extended the area under French control inland from the lagoon region. However, complete pacification was not accomplished until 1915. Ivory Coast officially became a French colony in 1893. Captain Binger, who had explored the Gold Coast frontier, was named the first governor. He negotiated boundary treaties with Liberia and the United Kingdom (for the Gold Coast) and later started the campaign against Almany Samory, a Malinke chief, who fought against the French until 1898. From 1904 to 1958, Ivory Coast was a constituent unit of the Federation of French West Africa. It was a colony and an overseas territory under the French Third Republic. Until the period following World War II, governmental affairs in French West Africa were administered from Paris. France's policy in West Africa was reflected mainly in its philosophy of "association," meaning that all Africans in Ivory Coast were officially French "subjects" without rights to citizenship or representation in Africa or France. In December 1958, Ivory Coast became an autonomous republic within the French community as a result of a referendum that brought community status to all members of the old Federation of French West Africa except Guinea, which had voted against association. Ivory Coast became independent on August 7, 1960, and permitted its community membership to lapse. Ivory Coast's contemporary political history is closely associated with the career of Felix Houphouet-Boigny, President of the republic and leader of the Parti Democratique de la Côte d'Ivoire (PDCI) until his death on December 7, 1993. He was one of the founders of the Rassemblement Democratique Africain (RDA), the leading pre-independence inter-territorial political party in French West African territories (except Mauritania). Houphouet-Boigny first came to political prominence in 1944 as founder of the Syndicat Agricole Africain, an organization that won improved conditions for African farmers and formed a nucleus for the PDCI. After World War II, he was elected by a narrow margin to the first Constituent Assembly. Representing Ivory Coast in the French National Assembly from 1946 to 1959, he devoted much of his effort to inter-territorial political organization and further amelioration of labor conditions. After his 13-year service in the French National Assembly, including almost 3 years as a minister in the French Government, he became Ivory Coast's first prime minister in April 1959, and the following year was elected its first President. In May 1959, Houphouet-Boigny reinforced his position as a dominant figure in West Africa by leading Ivory Coast, Niger, Upper Volta (Burkina), and Dahomey (Benin) into the Council of the Entente, a regional organization promoting economic development. He maintained that the road to African solidarity was through step-by-step economic and political cooperation, recognizing the principle of nonintervention in the internal affairs of other African states. In a region where many political systems are unstable, Ivory Coast showed remarkable political stability from its independence from France in 1960 until late 1999. Under Felix Houphouet-Boigny, President from independence until his death in December 1993, Ivory Coast maintained a close political allegiance to the West while many countries in the region were undergoing repeated military coups, experimenting with Marxism, and developing ties with the Soviet Union and China. His successor, President Henri Konan Bedie, was familiar with the U.S., having served as Ivory Coast's first ambassador to the U.S. Falling world market prices for Ivory Coast's primary export crops of cocoa and coffee put pressure on the economy and the Bedie presidency. Government corruption and mismanagement led to steep reductions in foreign aid in 1998 and 1999, and eventually to the country's first coup on December 24, 1999. Elections were scheduled for fall 2000, but when the general's handpicked Supreme Court disqualified all of the candidates from the two major parties—the PDCI and Rassemblement des Republicaines (RDR)--Western election support and monitors were withdrawn. The RDR called for a boycott, setting the stage for low election turnout in a race between Guei and Front Populaire Ivoirien (FPI) candidate Laurent Gbagbo. When early polling results showed Gbagbo in the lead, Guei stopped the process—claiming polling fraud—disbanded the election commission, and declared himself the winner. Within hours Gbagbo supporters took to the streets of Abidjan. A bloody fight followed as crowds attacked the guards protecting the presidential palace. Many gendarmes and soldiers joined the fight against the junta government, forcing Guei to flee. Having gained the most votes, Gbagbo was declared President. The RDR then took the streets, calling for new elections because the Supreme Court had declared their presidential candidate and all the candidates of the PDCI ineligible. More violence erupted as forces loyal to the new government joined the FPI youth to attack RDR demonstrators. Hundreds were killed in the few days that followed before RDR party leader Alassane Ouattara called for peace and recognized the Gbagbo presidency. On September 19, 2002, rebellious exiled military personnel and co-conspirators in Abidjan simultaneously attacked government ministers and government and military/security facilities in Abidjan, Bouake, and Korhogo. In Abidjan, government forces stopped the coup attempt within hours, but the attacks resulted in the deaths of Minister of Interior Emile Boga Doudou and several high-ranking military officers. General Guei was killed under still-unclear circumstances. Almost immediately after the coup attempt, the government launched an aggressive security operation in Abidjan, whereby shantytowns—occupied by thousands of immigrants and Ivoirians—were searched for weapons and rebels. Government security forces burned down or demolished a number of these shantytowns, which displaced over 12,000 people. The failed coup attempt quickly evolved into a rebellion, splitting the country in two and escalating into the country's worst crisis since independence in 1960. The rebel group, calling itself the "Patriotic Movement of Côte d'Ivoire" (MPCI), retained control in Bouake and Korhogo, and within 2 weeks moved to take the remainder of the northern half of the country. In mid-October 2002, government and MPCI representatives signed a ceasefire and French military forces already present in the country agreed to monitor the ceasefire line. In late November 2002, the western part of the country became a new military front with the emergence of two new rebel groups—the Ivoirian Popular Movement for the Great West (MPIGO) and the Movement for Justice and Peace (MJP). MPIGO and MJP were allied with the MPCI, and the three groups subsequently called themselves the "New Forces." In January 2003, the Economic Community of West African States (ECOWAS) placed approximately 1,500 peacekeeping troops from five countries—Senegal (commander), Ghana, Benin, Togo, and Niger—on the ground beside the 4,000 French peacekeepers. The troops maintained the east-west ceasefire line, known as the Zone of Confidence, dividing the country. In late January 2003, the country's major political parties and the New Forces signed the French-brokered Linas-Marcoussis Accord (LMA), agreeing to a power-sharing national reconciliation government to include rebel New Forces representatives. The parties agreed to work together on modifying national identity, eligibility for citizenship, and land tenure laws which many observers see as among the root causes of the conflict. The LMA also stipulated a UN Monitoring Committee to report on implementation of the accord. Also in January 2003, President Gbagbo appointed Seydou Diarra as the consensus Prime Minister. In March 2003, Prime Minister Diarra formed a government of national reconciliation of 41 ministers. The full government did not meet until mid-April, when UN peacekeepers (UN Operation in Côte d'Ivoire, or UNOCI) were in place to provide security for rebel New Forces ministers. On July 4, 2003, the government and New Forces militaries signed an "End of the War" declaration, recognized President Gbagbo's authority, and vowed to work for the implementation of the LMA and a program of Demobilization, Disarmament and Reintegration (DDR). On September 13, 2003, six months after the formation of the reconciliation government, President Gbagbo named politically neutral Defense and Security Ministers, after consulting with the political parties and New Forces. 2004 saw serious challenges to the Linas-Marcoussis Accord. Violent flare-ups and political deadlock in the spring and summer led to the Accra III talks in Ghana. Signed on July 30, 2004, the Accra III Agreement reaffirmed the goals of the LMA with specific deadlines and benchmarks for progress. Unfortunately, those deadlines—late September for legislative reform and October 15 for rebel disarmament—were not met by the parties. The ensuing political and military deadlock was not broken until November 4, when government forces initiated a bombing campaign of rebel targets in the north. On November 6, a government aircraft bombed a French military installation in Bouake, killing nine French soldiers and one American civilian. Claiming that the attack was deliberate (the Ivoirian Government claimed it was a mistake), French forces retaliated by destroying most of the small Ivoirian air force. Mayhem ensued for several days as anti-French mobs rioted in Abidjan and violence flared elsewhere. On November 15, 2004 the United Nations Security Council issued an immediate arms embargo on Ivory Coast and gave leaders one month to get the peace process back on track or face a travel ban and a freeze on their assets. In April 2005, South African President Thabo Mbeki invited the leaders to South Africa for an African Union-sponsored mediation effort. The result was the Pretoria Agreement, signed April 6, 2005. The Pretoria Agreement formally ended the country's state of war, and addressed issues such as Disarmament, Demobilization and Reintegration, the return of New Forces Ministers to government, and the reorganization of the Independent Electoral Commission. A follow-up agreement in June 2005 laid out another framework for disarmament, elections, and the adoption of legislation required under the Linas-Marcoussis Accord. At the end of March, Soro was named prime minister, and several days later, a new cabinet—consisting of most of the ministers from the previous cabinet—was named. Since then, UNOCI has withdrawn from the Zone of Confidence and several mixed brigades of New Forces, national army soldiers, and impartial forces carry out joint patrols in its place. Government ministries (particularly Health, Education, Finance, and Interior) and officials are gradually returning to their posts in the northern part of the country, as are important economic actors, such as banks and utilities. In September 2007, a series of mobile courts began issuing birth certificates to those who never had them in a few areas of the country. This is the first step in identifying voters. No date has been set for national elections. The disarmament, demobilizaton, and reintegration of former combatants has begun on a limited scale. An integrated command center has been created, but is not fully functioning. This page was last modified on 21 July 2016, at 08:44.